Depending on your requirements, we can build complete assemblies, sub-assemblies and even specialty assemblies, such as placing the product upside-down before it is shipped to simplify on-site assembly or production. 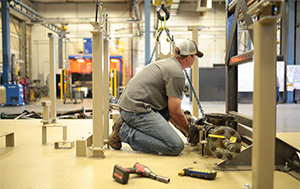 At Steffes, we strive to make it as easy as possible for our customers to get products out of the package and into the next step of production. We do in-process inspections to ensure quality and safety before the next stage of production. Our tag and mark system on finished assemblies provides clear identification to help make installation as easy and efficient as possible. We assemble all our products in a controlled environment to ensure the consistent quality for which Steffes products are known.